Maia Danks is an 18 year old ceramic artist from the Berkeley, California in the San Francisco Bay Area. 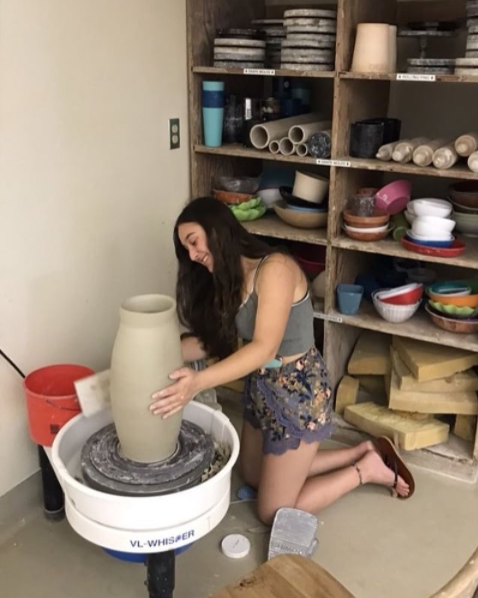 She now attends Carleton College in Northfield, Minnesota She has been making art her whole life, and has been working with ceramics for the past 10 years. Maia is a Scholastic Art and Writing Awards regional winner in their 2014, 2015, 2016, and 2017 competitions. She received the Scholastic Art and Writing Awards national award in 2018. Her hand-made jewelry and other artwork were exhibited and sold by Abrams Claghorn Gallery (formerly Albany Arts Gallery) in Albany, California from 2011 to 2017. Maia is an annual vendor at The Crucible's annual holiday sale, called Gifty, in Oakland, California. In addition to the gallery of her work included on this website, Maia also maintains an active Instagram account @OctopusCeramics. We invite you to engage in a dialogue with the artist via Instagram or to contact her using the form below. She can also be reached by sending email to: maia [at] octopusceramics.com .